When I was a kid, my mother would make elaborate meals for company and then forget to serve something. That always seemed kind of odd to me until I forgot to serve a key side dish one Thanksgiving. I knew the turkey was missing a certain zest . . . and I’ll avoid the painful pun but, yup, it was the cranberry orange sauce. Who am I kidding? I’ve been forgetting to serve food for years and so I try to remember to write a list (and remember to check it) when I am hosting on a special occasion. The great Lisa T., my partner in Middle East crime (or at least shenanigans) will never let me forget the time I made a great tomato sauce for gnocchi and told my guests that it made sense to shop at the expensive greengrocer because all the produce was so good and nothing got wasted . . . and only as I was speaking did I remember that I had never put out the side dish that would take the meal from okay to va va voom. The dish I forgot that day was lemon basil ratatouille, one of the recipes from the book that introduced the use of fresh and vibrant flavors into my cooking: the Silver Palate Good Times cookbook. For those of us who reached adulthood in the mid-eighties, the first Silver Palate book was our grown-up cookbook, but my mom gave me the Good Times book so that’s what I used. Another feature of my early adulthood was pot luck dinners and lemon basil ratatouille became my go-to dish. I liked to make it because (1) people loved it, (2) it was a little different from what other people made (i.e. not a recipe from the Moosewood Cookbook), and (3) it could work as a meal by itself if the other pot luck food was not great. My version has evolved a little over the years. Heat ¾ cup of the oil (or less, if you can get away with it) in a heavy skillet or chef’s pan over medium high heat. Add the eggplant slices and sauté, turning occasionally until they are golden. You may need to add more oil and you may need to sauté in batches (but don’t sweat it if the eggplant isn’t fully cooked through because it goes into the oven for a long time). Place cooked in baking pan–I use a 9 X 13 Pyrex pan. 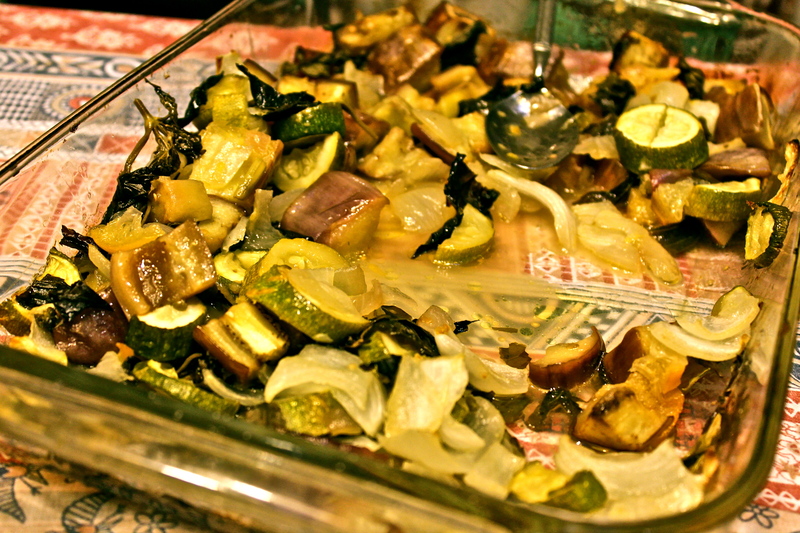 Quickly sauté the onion and zucchini in ¼ cup of olive oil for a few minutes and place in pan with eggplant. Add chopped shallot, chopped basil leaves, lemon juice, zest, preserved lemon, salt & pepper to the vegetables and stir it all to mix (you can use your hands or tongs). Cover with aluminum foil and bake for an hour. 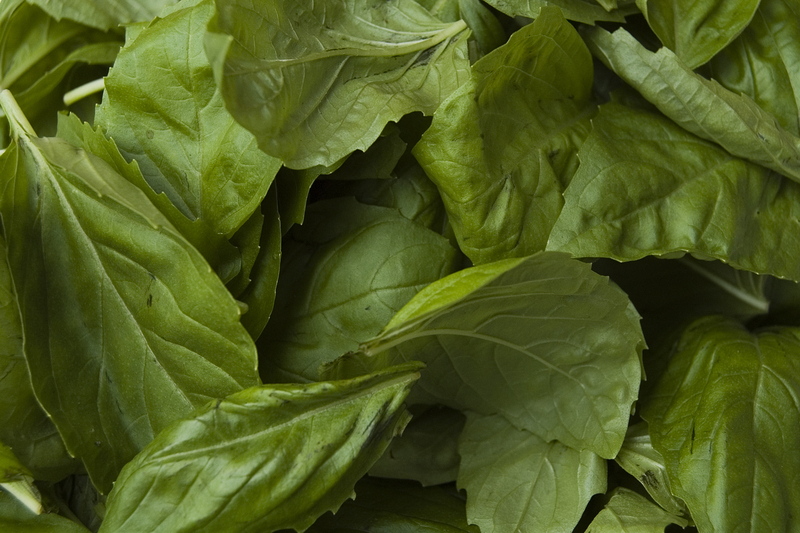 Serve hot or at room temperature as a side dish, a filling for crepes or even as a party dip. P.S. My mother was an early adopter of ratatouille thanks to her worship of Julia Child (whom she once met and told “You changed my life”). Mom made Julia’s ratatouille throughout my childhood and one day when I was around 16, I actually agreed to try it and discovered that it wasn’t gross. At this point, I’ve forgotten that there was a time when I didn’t love ratatouille. where can I get preserved lemons if I’m too lazy to make them? You can get preserved lemons at Whole Foods–I’m too lazy to make them. I actually asked at the olive bar at Whole Foods and they brought some from the back for me. Middle Eastern food stores also have them. If you can’t get them, you can leave them out as in the original Silver Palate recipe and double the amount of lemon juice and rind.